The spawning cycles of brown and rainbow trout offers the fly angler a unique opportunity to sight fish for some larger trout at two different times of the year. Now, this opportunity is more complex than “chucking eggs” or dragging streamers through the pools. To maximize your opportunities the anglers needs to understand the spawning cycle of each species and in understanding the situation choose the proper imitations and methods to take advantage of the situations encountered. Let’s begin this adventure during the fall of the year and the spawning cycle of the brown trout. During the fall the spawning run of the Brown trout the anglers will find them very territorial, attacking anything that comes into their area. Stripped Streamers or attractor types may produce reasonable results, however when a streamer or the like is stripped through the area the Brown trout may follow the imitation but as soon as the intruder is out of their area, the trout may turn off and not actually hit the intruder. However, there are other options which will discussed later, to better understand the actions of the brown trout we must focus on the spawning process itself. I believe that the trigger for the fall spawning run is the amount of daylight coupled with the cooling of the water temperature in the Yellowstone River. Yes, there are resident brown trout in the spring creeks and it is assumed that they spawn in the creek, but seeing as how brown trout return to where they were born some could leave the spring creeks to spawn in the Yellowstone River. However, we do know that a reasonable number of Brown trout do leave the Yellowstone River to spawn in the spring creeks. As I stated earlier I believe that the trigger for the spawning run is tied to the cooling of the water temperature in the Yellowstone River and the photo cycle or the length of the day. Therefore, the beginning of the spawning cycle can vary a little bit, however by mid-October the browns are starting move. As the time draws near the browns begin to leave their normal areas and gather in the pools of the Yellowstone River. There they begin to pair and move to their spawning areas. Now this doesn’t happen overnight, it takes a few days as the browns move to where they were born, and this means that some will travel a great distance. I remember years ago the Montana Fisheries Department was doing a tagging study on the Yellowstone where it was concluded that some browns travel up to fifty miles during their spawning run. 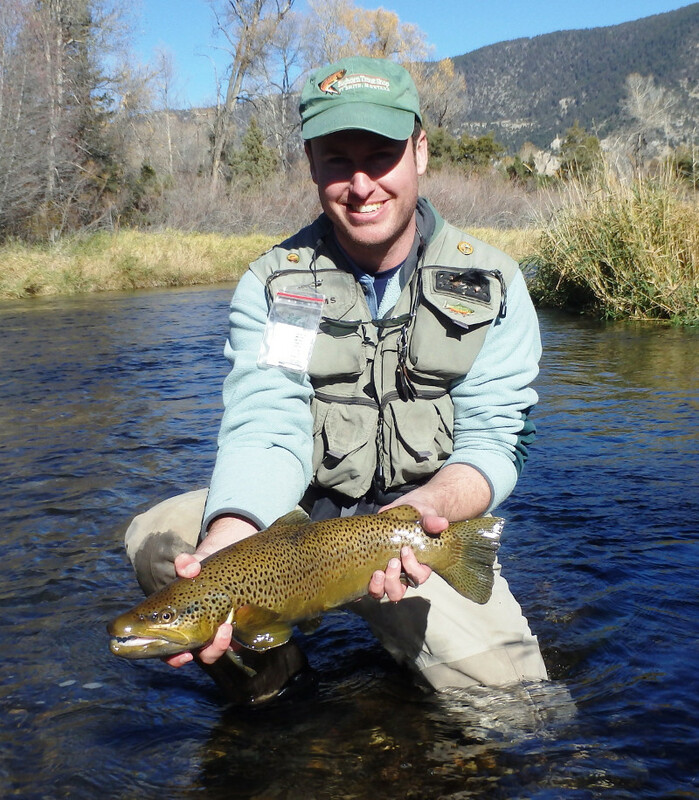 The brown trout will spawn in the main stem of the Yellowstone River, however a reasonable number do enter the spring creeks of Paradise Valley (Armstrong’s, DePuy’s and Nelson’s) to complete the spawning process. As they pair up and move up the creek the males become very aggressive, protecting their females by driving off smaller males and the rainbow trout that enter their area. During the fall spawning season angler will also notice the brown trout leaping into the air and doing belly flops on the surface of the water. This strange behavior by the brown trout is thought to be the trout loosening their eggs and sperm in preparation for the actual spawning or maybe they are just jumping for joy!! Now the male brown trout are extremely aggressive throughout the spawning process. Fighting off other males, smaller brown trout, rainbows and even whitefish that come into the area where the spawning pair is located. Once the browns enter the creek system they move up stream over a period of several days, by moving and resting in various locations. The spring creeks are fun to fish during the fall spawning run as you may encounter Midge hatches in the morning, Baetis hatches in the afternoon and the rainbows and some of the brown trout will feed on these hatches. However, during the fall, the weed growth is dying back, and the water levels decrease slightly making the spotting of brown trout that are moving in the creek system easier to see and being able to see the trout adds a whole new excitement to the adventure. Now, let’s continue on with the story of the spawning, on the lower sections of the spring creeks you see a fair number of larger brown trout over a period of four to six weeks. At first the trout are not yet where they will spawn, but as they move up the creek in stages they give the angler many chances to sight fish for some really nice larger brown trout. Now we finally come to the time period when we see several paired brown trout locating over suitable graveled areas. Then we see the actual digging of the redd (nest) where the trout will eventually spawn. Now before anyone goes radical on fishing for spawning brown trout, the actual process needs to be explained and understood, and I will add my own comments and beliefs. The actual spawning or laying of the eggs and fertilization takes place at night and during the low-light conditions of dawn and dusk. The females dig a dished-out depression, and this takes a while and the angler will often see the females digging while the males are protecting the area. As a matter of fact, you can see the females begin to dig in an area but then the next day they have moved up the creek. Once they are in their desired place and the redd is complete the female lay the eggs and the male fertilize them and then they cover the eggs with a layer of fine gravel, during this whole-time period the males are very aggressive protecting their redd. If fly fishing for spawning trout would deplete the resource or cause undue hardship to the populations the Fish & Game department would close the season. But each angler must make that decision for themselves, and there is no right or wrong answer, it is all a matter of personal choice. Another point that seems to come up all the time is the angler walking on the redds, now this is something that I try to avoid. However, the trout spawn over loose gravel and they dish out the redd and cover the eggs, this is nature’s way of protecting the eggs and this protects them from being walked on by deer, moose and elk or a host of other creatures that might be found in the water. If these creatures can walk over the redds without damaging them, then I doubt that anglers are doing any damage! The natural world has its own way of protecting itself, the eggs are small and soft and are buried in the loose gravel, this is their protection and studies have been conducted to prove this point. However, if you discover any creature out in the redd area with a shovel, then take the shovel away from them!! Now if you choose not to fish over redds or spawning areas that is a personal choice and I have no issue with it, however be kind and also respect others who do choose to fish over the spawning trout. This will cut down on senseless agreements on the stream, which accomplishes nothing and are very distasteful. Please respect the rights and choices of others. Now, back to the fishing, brown trout will eat eggs though they are not as keyed on eggs as rainbow trout. I also believe that the browns hit the eggs simply because they drift into their spawning areas. During the spawning periods brown trout are not focused on eating and stomach samples obtained by using a stomach pump have showed this to be true. However, the smaller trout of all species are interested in eating the eggs as they recognize them as a legitimate food form. The smaller trout will dart in and bump into the side of the female which sometimes causes them to expel eggs and during the actual spawning some eggs drift out of the redd and are consume by trout hanging below the redd. The pure aggressive nature of the spawning male brown trout is why they can be deceived by the angler during this time period. As I stated earlier many anglers often strip streamers/attractor flies through an area hoping to entice an aggressive brown trout. Sometimes this method works very well, and the angler enjoys success. However, I prefer to stalk and sight fish the browns during the spawning run on the spring creeks and I also prefer to use a dead-drift with some twitches with the streamers I employ. As a side note I use the same methods when I fish the side channels of the Yellowstone River during the brown trout spawning run in the fall. Now as for the streamers I prefer they are not created with any of the newer materials, they are simply feather streamers, constructed entirely with feather which move and create the illusion of life, yet which retains their minnow like shape and move and flutter when dead-drifted and/or twitched. Rib: Clear monofilament thread, reverse wrapped through the body. 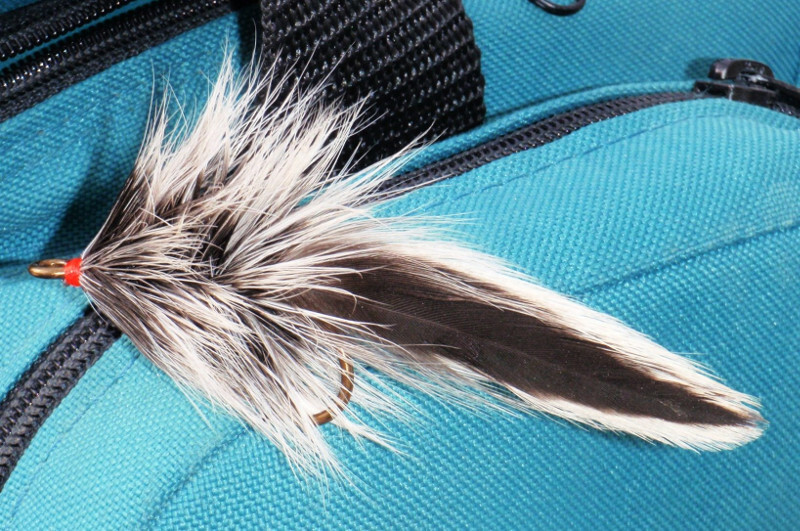 Body: Badger Hackles two at a time, tied in by the tip and wrapped forward in side by side wraps. Head: Red thread, coated with clear epoxy. The Western Spruce Feather Streamer was originally created by Chester Marion of Livingston, Montana. Chet was an excellent streamer fisherman who piled the waters of the Yellowstone River and was a friend. As an interesting side note, Chet created the pattern, but I got to name it. He told me he got the idea for the streamer from the Rhodes Tarpon Streamer. I adapted and modified the pattern for my own use and whereas Chet only tied his streamers in larger sizes, I tied them in many sizes and use them on all types of rivers, ponds and even on the spring creeks with excellent success. Due to the simplicity of the pattern all that is needed is change the colors of the feathers to be able to create imitations of many of the different minnows that the trout feed upon. I also tie this pattern in a Grizzly Dyed Dark Olive and Grizzly dyed Black all three variations are very effective, however my personal favorite is still the Lite Spruce since over the years this pattern has been responsible for some very nice brown trout. As for tackle when fishing the streamer during the fall my favorite rod is an 8 ½ ‘ or 9’ medium fast to fast action rod, six weight forward floating line and a nine foot 2x leader. The six weight rod and 2x leaders are needed to handle the larger flies, the wind and the larger trout the angler may encounter. Also by using stronger tippet the angler is able to subdue the trout quicker. Everyone seems to have their favorite stripping method when using streamers and if your method is working for you---great, keep using it. However, I prefer to stalk the trout and sight fish to them and I have found that by casting above the trout and allowing the streamer to dead-drift into their area with and occasional twitch is much more effective, and it keeps the imitation in front of the intend target longer. Depending on the weight of the imitation and the depth of the water I will place a strike indicator three to four feet above the streamer. The strike indicator allows the angler to judge the speed of the drift and to mend to slow down the drift all of which translates into more hook-ups for the angler. I will also fish and egg imitation with the streamer following on a dropper six to seven inches behind the egg, this rig imitates a minnow chasing an egg and is also deadly on the very aggressive male brown trout during the spawning time period. Recipes’ of my favorite egg imitations can be found in the section covering the Rainbow Trout. Most of the trout taken during the first three quarters of the spawning cycle are males, those beautiful bright hook jawed creatures which many fly fishers seek. However, as the spawning cycle reaches its peak and the pair is guarding, holding and working on their Redd, then you may begin to pick off a few females. Just the chance to watch the brown trout as they move through their spawning cycle is exciting and extremely interesting to watch periods of extreme activity and at other times everyone seems to be holding peacefully on the bottom where they seem to be resting up for the next period of extreme activity. Fishing for the fall run brown trout is an adventure like no other and the number of larger trout will indeed surprise you, some of them may reach lengths of twelve inches to a foot!